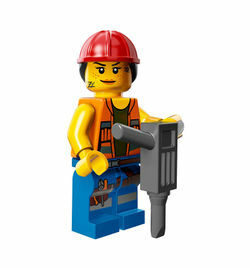 Gail the Construction Worker is one of the characters in the 2014 film, The LEGO Movie. She is one of the construction workers, like Emmet and Frank. She is the first female construction worker to be made in physical form. Each member of the Bricksburg construction crew has his or her own special way of standing out. Everybody knows Gail: she’s the perky one! No matter how hard the day’s work may be, you can always count on her to stay cheerful while she builds and sings along to the Everything is Awesome song. But as perky as Gail is, even she has never really noticed Emmet among her fellow construction workers. As far as she knows, he’s just another smiling yellow face in the crowd. Maybe if he does something really important, then she’ll finally remember his name! Facts about "Gail the Construction Worker"
This page was last edited on 9 January 2016, at 22:38.